In the vast land of Maharashtra which plays home to the flamboyant city of Mumbai and Pune, lies a small town and in fact, the smallest hill station of India. Matheran, the beautiful landscape kept and preserved so gently that no automobiles are allowed to enter this hill station till date. This article guides the travellers on the things to do and the path they have to take to get there. Matheran, a small hill station in the Indian state of Maharashtra is also the smallest hill station in India. The term Matheran suggests “forest on top”. Matheran is a beautiful tourist destination filled with thick luscious greeneries, serene environment with a picturesque landscape and an unadulterated ambience. It is located just 90 km from Mumbai and 120 km away from Pune making it a popular choice for a quiet weekend getaway for the working urban folks. It is Asia’s only automobile free hill station. Due to the ban of vehicles in this hill station it is a very quiet place despite the thousands of people visiting it. And with the huge number of visitors flocking in, the Matheran hotels are always busy throughout the year. Hotels are available in abundance in Matheran and there are a lot of them built in built in British style architecture. There are also many Parsi bungalows. The best thing to do in Matheran is to go up to the viewpoints and enjoy the majestic view from the top. There are close to 38 designated look-out points in Matheran including a panorama point which provides a 360 degree view of the surrounding area. There is a entry fee (of Rs 50 for adult visitors and Rs.25 for children from June 1, 2015) to Matheran. The proceeds from this is used for the upkeep of the place considering its fragile ecosystem. 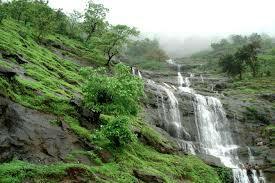 Post monsoon is the best time to visit Matheran. The greeneries are full and fresh after the rains, the lakes are filled with water and the waterfalls gush down in all its glory making for a fabulous view. Being in close proximity of big cities, this place sees alot of people from nearby cities during weekends where people come with their families and loved ones. 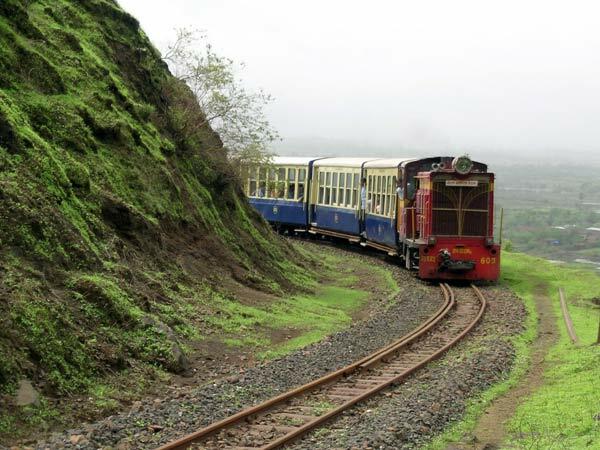 Matheran has a special toy train which connects it to the various cities and towns nearby. You could either take a train or an Indigo, Air India or Jet airways flight to Pune or Mumbai and travel by road to the town of Neral. From Neral station you will have to catch the special toy train to Matheran. The train is often full so turn up in a good time to ensure you get a ticket. The tickets usually sell out within an hour prior to journey and the queue can be as long as 30-60 minutes. This train runs 4 times a day and it will be the experience of a lifetime as you ride along the curves of the hills and enjoy a never before experienced ride.